Browse a newly opened art gallery featuring many photography, mixed material sculpture, and jewelry. Stop in to this family owned and operated gallery and say ‘Hi!’ to the Knox’s (Mary and David). Don’t miss the upstairs area. Stairs are near the back of the building and lead up to more displays. The Eno Gallery features many artists local and national. They exhibit solo exhibitions as well as group throughout the year and focus on various mediums. Come look around and make sure you head back to the right hand side of the gallery so that you can go upstairs or you’ll miss the second floor which also has a nice view of the Old Courthouse lawn! 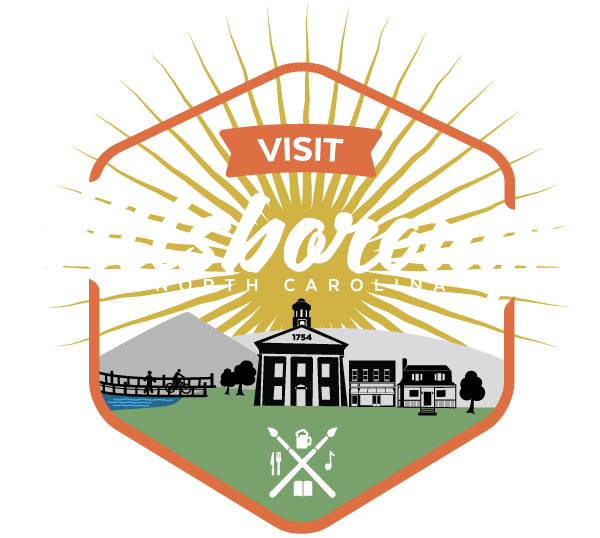 Hillsborough Gallery of Arts is an artist lead space featuring fine art and fine craft goods ranging from watercolor to jewelry, ceramics, wood pieces, and mixed materials. Feel free to spend some time browsing the local creations of our area artists and be sure to ask the volunteer working there ‘What is your favorite thing in the store right now?’ so that you can get some shopping help. Also, make sure to ask about what the Arts Council’s next project or event is- you may want to come back for it! Swing by to window shop and view some of the beautiful Hillsborough Landscapes painted by our very own MAYOR TOM! Sure, every small town has it’s local heros and well-known persons, but our small town has a mayor who is both a politico AND an artist. Not surprising for Hillsborough, with our vibrant arts, music, and literature scene. Mayor Tom is a busy guy, so you’ll have to come by during Last Fridays to get inside, but his gallery features a huge picture windows and paintings are easily viewed from street level.